A must watch for divers and anyone who cares about the marine environment. A new study found that when it comes to surviving in the non-Pixar sea, being adorable isn’t enough. The underwater world in the Disney film is teeming with cheery creatures. But a study says that of the real-life species associated with those in the film, many face the threat of extinction. The underwater world on display in Disney’s “Finding Nemo” is teeming with a dizzying array of cheery creatures, from sea turtles to seahorses and mackerel to sharks. So a team of Canadian and U.S. scientists decided to assess the mythical ecosystem inhabited by the small clownfish and his friends to see how their real-world counterparts were faring. Sixteen percent of the species associated with characters in “Finding Nemo” that have been evaluated face the threat of extinction, according to the study, which was conducted by the International Union for Conservation of Nature (IUCN) and Canada’s Simon Fraser University. The analysis of 1,568 species is not just a whimsical look at American popular culture and its cartoon characters. It reveals how humans treat some of the ocean’s most charismatic inhabitants. “These are species that should be doing better because they are the ones we care about,” said Loren McClenachan, a post-doctoral fellow at Simon Fraser University. She said that highly migratory species such as turtles, sharks and rays are particularly vulnerable to fisheries and other human pressures. “They’ve got life histories that cause them to interact with people wherever they go,” McClenachan said. The Oscar-winning 2003 Disney/Pixar movie, which details how the clownfish Marlin defies all odds to save his son from the aquarium trade, has a conservation message. But the film actually inspired a booming aquarium trade in the bright orange fish with white stripes, significantly reducing native clownfish populations on coral reefs in Australia and elsewhere. While the IUCN classifies clownfish as a “species of least concern,” meaning it does not face an imminent extinction risk, 18 percent of the evaluated species that are related to Nemo — those of the scientific family Pomacentridae — are at risk of extinction. There have been few formal scientific assessments of coral reef fish populations that are sought by the aquarium trade, McClenachan said, so “it’s very hard to know the true extent of the aquarium, live reef and curio trade.”Disney officials could not be reached for comment. “When people see a beautiful film about tigers, they don’t go out and shoot a tiger. They don’t go out and purchase a tiger,” Worm said in an interview. Direct exploitation is the key driver of many of the species’ decline. Many sharks are being targeted to make the Asian delicacy shark fin soup; seahorses are coveted as curios. Other species, such as sea turtles, are vulnerable because they can easily get entangled in commercial fishing gear and because their nesting areas have been trampled or hampered by development. “They are truly the celebrities of the ocean,” Hammerschlag wrote in an e-mail. A survey of the animals with speaking parts in “Finding Nemo” gives a decent sense of how these species are doing. More than half of all hammerhead sharks (personified by “Anchor” in the movie) face a threat of extinction, according to the IUCN, along with all species of marine turtles (“Squirt” and “Crush”). Those species, McClenachan said, “are more threatened than the most threatened vertebrates on land.”Nicholas K. Dulvy, who co-authored the study and serves as the Canadian Research Chair in Marine Biodiversity and Conservation, said the group of species he and his colleagues analyzed is not representative of the ocean as a whole. It is “a biased sample, but it’s biased in interesting ways,” he said. In some cases, these populations are beginning to rebound. Nesting populations of marine turtles in Costa Rica increased by more than fivefold between 1971 and 2003, for example, after authorities began protecting nesting females there. And the Convention on Migratory Species’ 116 member parties will ban fishing for giant manta rays and impose measures to safeguard their habitat after the group voted to protect the species. Dulvy, who also chairs the IUCN Shark Specialist Group, said the paper aims to highlight the “conservation bottleneck” many species face even after researchers have documented their steep population declines. Fewer than 10 percent of the threatened shark and ray species surveyed by the study are protected under the Convention on International Trade of Endangered Species of Wild Fauna and Flora (CITES). CITES Director-General John E. Scanlon said in a recent interview that his group is working to build political support to protect additional marine species, as well as to raise funds from member nations to support legal enforcement of wildlife trade bans. For the four authors of the Nemo paper, focusing on the here and now meant watching the movie four or five times. But Dulvy said he came away with a better impression of the film than when he first saw it eight years ago, especially after watching Bruce the Shark struggle with his pledge to stop eating fish. “They tried to portray sharks in a way more positive way than is usually done. But they showed them to be fallible, which makes them closer to reality,” he said. The biggest wave ever to hit Irish shores – 20.4 metres (67ft) high – has been recorded, meteorologists have revealed. 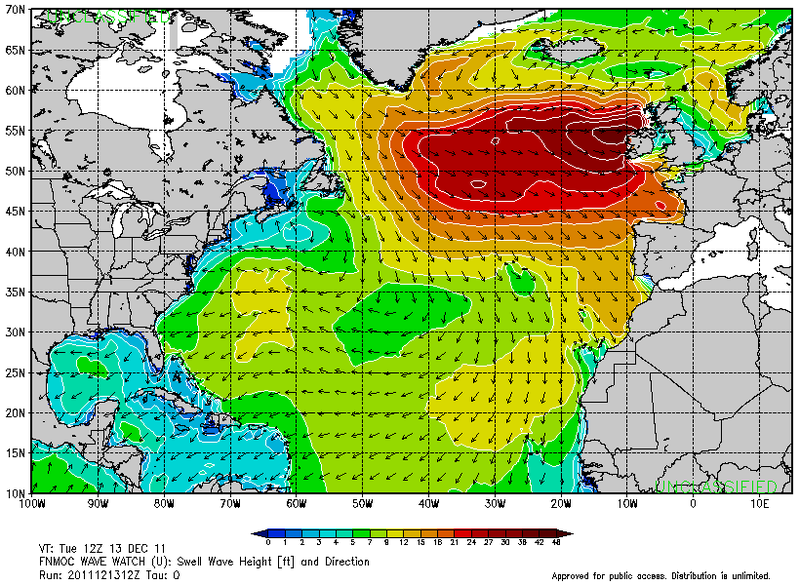 The wave was measured at a special buoy off the Donegal coast on Tuesday as a force ten storm raged. Meteorologists at Met Eireann said the data, sent from about 60 miles from the Irish coast, provided evidence of the most severe weather conditions it has encountered that distance offshore. " 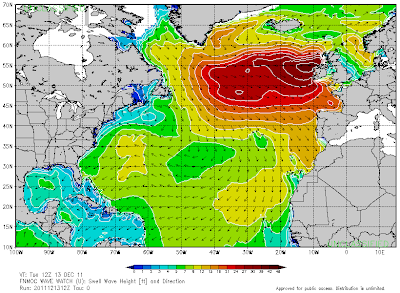 At 14.00 (Tuesday 13th December 2011) the M4 weather buoy off the Donegal coast recorded a maximum wave height of 20.4 metres which is the highest maximum wave recorded in Irish waters," Met Eireann reported. 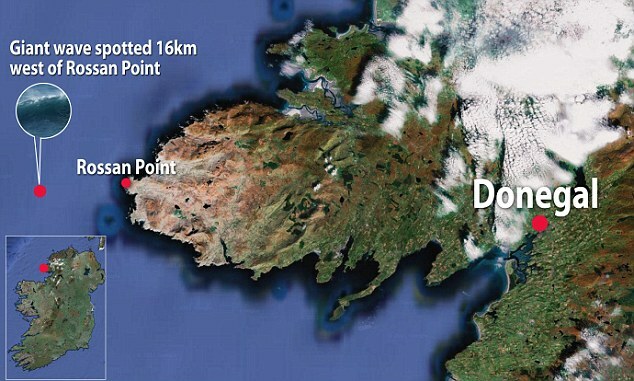 At Malin Head, the most northerly tip of Ireland, wind gusting to 87mph (140km/h) was recorded. Elsewhere, the Irish coastguard has urged people to stay off exposed coasts, cliffs, piers, harbour walls, beaches and promenades during this week's forecast stormy weather. Winds and stormy conditions will ease on Tuesday night before freezing conditions hit Ireland on Thursday and there is a risk of a second storm hitting the south and midlands. Forecasters, however, said there was a chance the storm might miss Ireland to the south. The Weather Buoy project is a collaborative initiative between the Department of Transport, Marine Institute, Met Eireann and the UK Met Office. "The combination of tides, forecasted gale warnings for the next day or so, high sea conditions and swollen rivers may result in very dangerous conditions." Much of the UK also faces several days of battering winds and localised blizzards as a pair of particularly lively weather systems pass over the country in quick succession. Later on Tuesday gales were expected to batter the north of Northern Ireland and the west of Scotland, peaking at 80mph in coastal areas, where ferry services in the west of Scotland have been badly affected. This will be combined with driving rain and, on higher ground, reasonably heavy snowfalls, mainly in the Borders and in Dumfries and Galloway. Conditions should ease during Wednesday and early Thursday, but only before another stormy weather system arrives, currently massing over the Atlantic. 1913, Dodd, Mead, and Company, New York. Volume I, page 48. One hundred years ago, on Dec. 14, 1911, the Norwegian Roald Amundsen and four companions trudged through fog, bitter cold and lacerating wind to stand at the absolute bottom of the world, the South Pole. Nowhere was there a trace of their British rival, Robert Falcon Scott. No Union Jack mocked them, no ice cairn bespoke precedence. The Norwegians had won the race. The Norwegian party pitched a tent as near to the actual pole as they could calculate. Amundsen and Scott were commanding forces driving early exploration of Antarctica, the ice-covered continent almost half again the size of the United States and unlike any other place on Earth. Both were driven by ambition to win fame by grabbing one of the few remaining unclaimed geographic prizes. Each was different, though, in temperament and approach to exploration, which may have been decisive in the success of one and the undoing of the other. Earnest and methodical, Amundsen had previously wintered over with an expedition in Antarctica and succeeded in the first navigation of the Northwest Passage, north of Canada, as he learned well how to prepare for work on the planet’s coldest, most unforgiving continent. He knew from experience how indispensable well-trained dogs were for pulling sledges. His next destination was to have been the North Pole. Scott was a Navy officer and a gentleman who had led an expedition that fell well short of the South Pole because of poor planning and execution. He had a romantic view of exploration as a self-affirming adventure, a kind of trial by ice. This the Scott party had to do. Its motorized sledges and the ponies soon broke down, leaving them to pull the sledges all the way up a glacier to the high polar plateau. When Amundsen’s men already were only a week away from their base camp at the Bay of Whales, to complete their 2,000-mile round trip, the exhausted British team arrived at the pole on Jan. 17, 1912, five weeks too late. How deflating to see the Norwegian flag, alert to the wind. Disappointment then turned to tragedy. Stalled by a nine-day blizzard, weak from hunger and sledge-pulling fatigue on the return trek, Scott and his four team members perished by the end of March. Most of the bodies were not found until November, at their last camp, among diaries and field notes and rock specimens they had gone perhaps too far out of the way to collect. Scott may have lost the race to the pole, but in death, he prevailed in the narrative for much of the last century as the brave and stoic hero of legend. The time of Amundsen and Scott was the heroic age of Antarctic exploration. The adventurous were in part attracted to the ice because, as the British mountaineer George Mallory was to say of Everest, it was there: a recognized new challenge. Even so, the same competitive spirit drove individuals and nations to seek to be first to make scientific discoveries, as Edward J. Larson, a Pepperdine University historian and author of the recent book “An Empire of Ice: Scott, Shackleton, and the Heroic Age of Antarctic Science,” describes in the Dec. 1 issue of the journal Nature. As early as 1900, Dr. Larson notes, the British, notably teams under Ernest Shackleton and to a lesser extent Scott, as well as German scientists, measured the movement of glaciers and mapped the coast and the interior. From seabed sediments and outcrops they determined that Antarctica was a true continent — with a landmass underlying thick ice — in contrast to the Arctic, where the ice more thinly covers a wide sea. From fossils they learned that the continent was once warmer and home to abundant life, all clues to its earlier link to other southern continents. Advances in aviation, icebreakers and other technologies after World War II opened the Antarctic to wider and more sustained scientific research. The United States and about a dozen other countries established permanent living quarters, supply depots and research facilities, the infrastructure for year-round living and increasingly ambitious research projects. Now, from coastal ice shelves to the 10,000-foot polar plateau, from subglacial mountain ranges to pristine lakes sealed under ice, Antarctica is one vast international laboratory for research in sciences as diverse as astrophysics and climatology, geophysics and oceanography. Looking ahead, the National Academy of Sciences has just published a study, “Future Science Opportunities in Antarctica and the Southern Ocean,” identifying key questions that should drive research there in the next 10 to 20 years. The report’s principal recommendations focused on researching the continent’s role in global climate change. Polar scientists were not surprised. “We’ve become very aware of the importance of polar regions in recent years as the harbinger of changes to come on a global scale,” said Raymond S. Bradley, director of the Climate System Research Center at the University of Massachusetts, Amherst, who primarily studies the Arctic and was not directly involved in the academy report. Robin E. Bell, a senior research professor at Columbia University’s Lamont-Doherty Earth Observatory who participated in the academy study, called attention to the report’s conclusion that a greater knowledge of rising temperatures and melting ice in some parts of the continent “will allow scientists to better predict” climate everywhere else. “Antarctica is most critical to understanding the global climate system and creating models for predicting changes in the future,” Dr. Bell said. The National Science Foundation asked the academy to prepare these recommendations as guides in deciding which projects to support with grants. The government agency is spending $67.4 million this year on Antarctic projects. Since the advent of satellite imagery in the 1970s, NASA and the National Oceanic and Atmospheric Administration have gathered much of the data calling attention to the continent’s involvement in climate change. Changes in the ice sheet, which covers roughly 97.6 percent of the continent, is already the subject of new research along the lines of academy recommendations. An international team of researchers, financed by the N.S.F. and NASA, will travel by helicopter this month to the remote Pine Island Glacier’s ice shelf. Scientists will use remote-sensing instruments to investigate the cavity beneath the ice shelf where it extends beyond the land and over the ocean. They hope to determine how relatively warm ocean water enters this cavity and undercuts the bottom of the glacier, melting and releasing more than 19 cubic miles of ice into the sea each year. Such research builds on activities started in the International Polar Year, 2007-9, which brought an infusion of fresh ideas and new projects to Antarctic science. 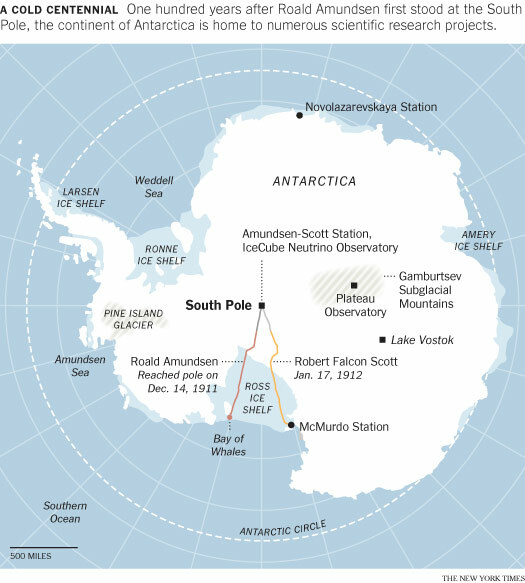 A seven-nation team of scientists, for example, investigated the mystery of the Gamburtsev Subglacial Mountains, two miles beneath the East Antarctic ice sheet. They used aircraft equipped with ice-penetrating radars, gravity meters and magnetometers to learn how a mountain range bigger than the Alps formed where it did. In a report last month, the scientists concluded that the mountains are the remains of a collision of several continents a billion years ago. Its traces extend from Antarctica across the ocean to India. Dr. Bell of Columbia, one of the project’s leaders, said the next step will be to drill through the ice to obtain the first rock samples from Gamburtsev. In addition to insights into earth history, scientists still find much to be learned from and about Antarctica itself. For years, Russians have been drilling through the ice to Lake Vostok, the largest of more than 140 subglacial lakes on the continent. They may finally break through next year to collect a sample of water presumably supersaturated with oxygen. If there is life in the water, it evolved in cold darkness and under high pressure over millions of years. Any sign of life in Vostok may strengthen the prospect of finding life on Jupiter’s moon Europa and Saturn’s moon Enceladus, which appear to have under-ice seas of liquid water. In the thin, dry atmosphere at the Amundsen-Scott South Pole Station, the clarity of light is an astronomer’s dream. Several types of telescopes there observe some of the earliest events in the cosmos and are searching for clues to the nature of dark matter and dark energy that presumably constitute 95 percent of everything in the universe. Other telescopes keep track of solar eruptions as an early warning system of stormy space weather endangering communications and navigation satellites. The recently completed IceCube Neutrino Observatory. 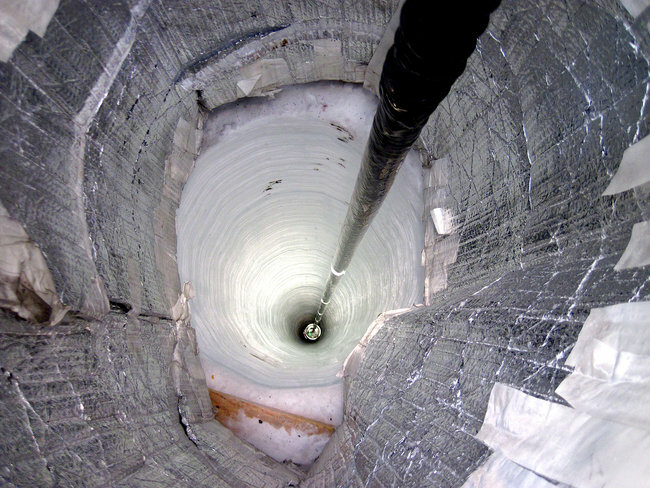 A new instrument known as IceCube Neutrino Observatory was completed to track the high-energy, nearly mass-less particles that are ubiquitous but so difficult to detect as they pass through Earth. Neutrinos could provide insights into the longstanding mystery of the origin of ultra high-energy cosmic rays. Nearby, seismometers are listening posts for earthquake reverberations bearing clues to the structure of Earth’s inner core and lower mantle. About 700 miles east of the South Pole, China is developing the large Plateau Observatory. The country’s astronomers, who had lacked high-quality observing sites, said they looked forward to research in the clear polar skies where the nights are four months long. Amundsen spent an extra three days before leaving the South Pole. He and his men — Helmer Hanssen, Sverre Hassel, Oscar Wisting and Olav Bjaaland, the one who took the classic picture of the other four at the pole — wanted to make sure they were really there, at the pole exactly. The Americans Frederick Cook, in 1908, and then Robert E. Peary, a year later, claimed to have reached the North Pole, but the evidence they reported was disputed even then, and especially ever since. The careful and methodical Amundsen was not about to leave room for a particle of doubt. She thinks it was “a really cool thing” (what other pun would you commit in a polar context?) that Amundsen had his men spend those three days skiing for miles out in all directions, taking sextant readings of the sun at different places and times of day to be sure they were close to or at 90 degrees South. He reasoned that at least one of them would cross and record the exact spot. Before leaving, the party pitched a black tent as near to the actual pole as they could calculate. In the tent Amundsen left spare equipment Scott might need and a letter addressed to King Haakon of Norway. It was his report of triumph. In a separate note, he asked Scott to deliver the letter to the king, if the Norwegian party failed to survive the return trip. These two things Amundsen did while at the pole — double checking where they were and recording the story of a deed done — seemed in character. Of course, Amundsen made it back to his base in 99 days, 10 fewer than expected; of his 52 dogs, 11 had survived. The other dogs, weakened over time, were sacrificed for meat to sustain the remaining ones and the men. And Amundsen, as ever preparing for eventualities, made doubly sure the world would know of his success. He would have done the sporting thing. The news would have been delivered to the King of Norway that his subjects were the first to reach the South Pole. In 1961 scientist tried to drill the mantle of the Earth with Project MoHole. Although it failed, it was the start of many decades of international collaboration in scientific ocean drilling. For over 50 years the science community is gaining knowledge on System Earth by recovering sediments from Ocean floors all over the world. This week’s Seafloor Sunday is a short teaser video for an upcoming documentary about scientific drilling in the deep sea focused on the Integrated Ocean Drilling Program (IODP) and its legacy programs — the Ocean Drilling Program (ODP) from 1983-2003 and the original Deep-Sea Drilling Program (DSDP) from 1966-1983. Drilling into and acquiring core samples of marine sediments and oceanic crust has had an enormous impact on our understanding of the Earth. Marine sediments are the most complete record we have of climatic and oceanographic change from timescales of thousands of years to tens of millions of years. One of the important aspects of IODP is the archival of the cores for the scientific community use. That is, even if you don’t directly participate in the cruise you can visit one of the core repositories to view and sample the cores to help answer scientific questions you are interested in. UN climate talks have closed with an agreement that the chair said had "saved tomorrow, today". Management of a fund for climate aid to poor countries has also been agreed, though how to raise the money has not. Talks ran nearly 36 hours beyond their scheduled close, with many delegates saying the host government lacked urgency and strategy. Nevertheless, there was applause in the main conference hall when South Africa's International Relations Minister, Maite Nkoana-Mashabane, brought down the long-awaited final gavel. "We came here with plan A, and we have concluded this meeting with plan A to save one planet for the future of our children and our grandchildren to come," she said. Eventually, a Brazilian diplomat came up with the formulation that the deal must have "legal force", which proved acceptable. The roadmap proposal originated with the EU, the Alliance of Small Island States (Aosis) and the Least Developed Countries bloc (LDCs). They argued that only a new legal agreement eventually covering emissions from all countries - particularly fast-growing major emitters such as China - could keep the rise in global average temperatures since pre-industrial times below 2C (3.6F), the internationally-agreed threshold. "If there is no legal instrument by which we can make countries responsible for their actions, then we are relegating countries to the fancies of beautiful words," said Karl Hood, Grenada's Foreign Minister, speaking for Aosis. "While they develop, we die; and why shoul we accept this?" Delegates from the Basic group - Brazil, South Africa, India and China - criticised what they saw as a tight timetable and excessive legality. "I stand firm on my position of equity," said an impassioned Jayanthi Natarajan, India's environment minister. "This is not about India, it is about the entire world." India believes in maintaining the current stark division where only countries labelled "developed" have to cut their greenhouse gas emissions. Western nations, she said, have not cut their own emissions as they had pledged; so why should poorer countries have to do it for them? Xie Zhenhua, head of the Chinese delegation, agreed. Apparently trembling with rage, he berated the developed countries: "We are doing things you are not doing... we want to see your real actions". However, Bangladesh and some other developing countries weighed in on the side of Aosis, saying a new legally-binding deal was needed. Aosis and the LDCs agree that rich countries need to do more. But they also accept analyses concluding that fast-developing countries such as China will need to cut their emissions several years in the future if governments are to meet their goal of keeping the rise in global average temperature since pre-industrial times below 2C. Once the roadmap blockage had been cleared, everything else followed quickly. There were some surreal moment of confusion, but few objections, except from members of the Latin American Alba group, who said the developed world was not living up to its promises. A management framework was adopted for the Green Climate Fund, which will eventually gather and disburse finance amounting to $100bn (£64bn) per year to help poor countries develop cleanly and adapt to climate impacts. There has also been significant progress on Reducing Emissions from Deforestation and forest Degradation (REDD). Environment groups were divided in their reaction, with some finding it a significant step forward and others saying it had done nothing to change the course of climate change. Many studies indicate that current pledges on reducing emissions are taking the Earth towards a temperature rise of double the 2C target. Michael Jacobs, visiting professor at the Grantham Research Institute on Climate Change and the Environment in London, said the agreement could bring real changes. "The agreement here has not in itself taken us off the 4°C path we are on," he said. "But by forcing countries for the first time to admit that their current policies are inadequate and must be strengthened by 2015, it has snatched 2C from the jaws of impossibility. "At the same time it has re-established the principle that climate change should be tackled through international law, not national, voluntarism." If you've heard that there's a "garbage patch" twice the size of Texas floating around in the Pacific Ocean, it's because Capt. Charles Moore has been working very hard to make sure that you do. Moore charts his journey from concerned mariner to active citizen scientist in Plastic Ocean: How a Sea Captain's Chance Discovery Launched a Determined Quest to Save the Oceans (Avery, 2011). Moore grew up on the harbor and spent his early years sailing the Pacific with his father. His love and respect for the open waters comes from his intimate relationship with it. Above all, he sees the vast ocean as a refuge for pristine nature; a place free from the touch of man's technology, development, and waste. In a 1997 voyage, Moore first started noticing trash bobbing in waters thousands of miles away from civilization. In that moment, the wheels started turning on what would become his mission for at least the next 15 years. When one sees the heartbreaking images of a half-decayed Laysan albatross with a gut full of water bottle caps, disposable lighters, and Bic pens, only the most cynical among us could continue to believe that our single-use culture is not culpable in the irreparable harm being done to the natural world. And while Moore shares this view about large plastic debris, several key moments caused him to start to ask questions about all the microplastics that we can't readily see and so are less likely to elicit such a visceral reaction, but that may be doing even more harm. With the rigors of publishing a peer-reviewed paper in mind, Moore and his team devised a research project that would compare the amount of small plastic bits bobbing around just under the surface of the waters with the amount of zooplankton, the very basis of our entire food chain. He discovered that, by weight, there was six times more plastic than life in his samples. The obvious problem with this is that animals, from the smallest on up to the Laysan albatross, eat more plastic than actual food. The issue that Moore had to tease out, but that might pose an even greater risk to all lifeforms that depend on the sea (that is, all of us) is that plastics are not only toxic in and of themselves, they also act as sponges and soak up the most harmful and persistent toxic compounds that contaminate our environment. These toxins enter the food chain at the bottom rung and continue to biomagnify as they work their way up, ultimately to man. This well-told memoir is part detective story and part adventure tale with dashes of history and science lessons thrown in. Moore is a passionate individual, but this is paired with a very practical nature. He doesn't take an extreme view by calling for an end to all plastics, and he acknowledges the cultural and technological advances that our plastic era has brought. He does, however, think that an ocean with more plastic than sea life in it is a tragedy, and he does have very specific policy changes in mind that would remedy, or at least mitigate, that problem. Part of his call is for the development of plastics that would biodegrade in the marine environment so that if they do find their way into the waters, they will break down instead of lingering and doing damage. This is just part of his overarching goal for manufacturers to be held accountable for the full life of the things that they produce, including their disposal, and for our society to move to one of zero waste. It's a challenging call, but not an impossible one. Moore makes a strong and impassioned case that is hard to ignore and is inspiring enough to make you want to try.